Currently a lot of work is done using a mid-range GPR such as the 400MHz antenna that we offer. However, we strongly recommend that you also use a higher frequency antenna such as the 1GHz or 1.5GHz alongside the 400MHz. The radar you are looking for is a Groundvue 3, either single or multi-channel. The reason for recommending more than one frequency is simple. How many utilities do you want to detect? It isn’t true that GPR cannot find fibre optic cables or that the telecoms close to the ground surface are untraceable by GPR. If you use a higher frequency radar with better target definition, you stand a much better chance of detecting these cables, just as we did. To date we are the only GPR manufacturers to detect the fibre optic cables at the JK Guest Test Centre (“MTU Centre of Excellence”) in Wigan. We did so using Groundvue 3 with a mixture of antenna frequencies. Groundvue multi-channels are unique in that they are not fixed wing. You can have any combination you like, at any distance from other antennas that suits you. We will work round your requirements. If you are covering a large area, you may want to make use of an 8 channel system. How accurate will my results be? For accurate utility detection, it is important that the survey location is accurately recorded. You can use either GPS or Total Station along with Groundvue – the GPS data is recorded in the same file as the GPR data without slowing down data collection. If you prefer to stick with survey reference lines, your Groundvue uses a good quality magnetic encoder to measure distances travelled. As far as depths are concerned, radars measure very accurately in nanoseconds time. The problem, of course, is that we need an answer in metres/centimetres or feet/inches. To make the translation every GPR needs to take account of transmission velocity. This varies with every site. We can give you guidelines but we can also teach you how to calibrate accurately for every site you survey. Yes, you can cut corners on this – ignore the calibration & produce an estimated depth - but is that what you want to do in the name of “easy” science? It’s not difficult. 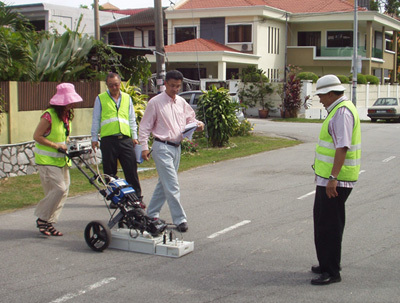 It is important to know that GPR works to its own accuracies which are a function of the wavelength(s) emitted. It’s not rocket science – we can help you work these out. What will my equipment look like? Most utility detection is done from a trolley but it is also possible to mount antennas on a vehicle or hand-tow them over rough ground. What about Fibre Optic Cables? 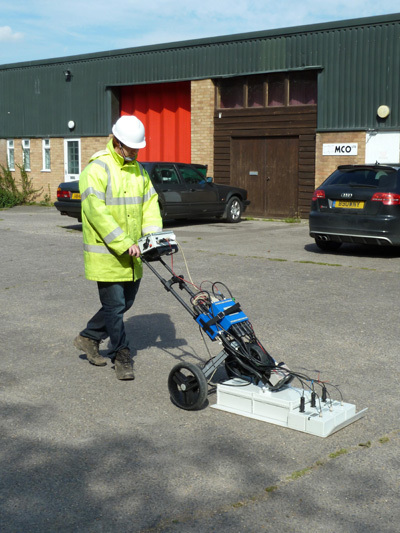 There is a myth that GPR cannot be used to detect fibre optic cables. This is not true. If you only use one frequency (and "duos" are single frequency systems - they just extract two bands from the single frequency), then you will not be able to detect all types of target. The wavelength needs to be matched to the target size. Using a high (or very high) frequency antenna alongside the traditional mid-range frequency antenna, you'll be able to image small shallow targets as well as the deeper traditional utilities. Still don't beliieve us - watch Finding Fibre Optic cables with GPR on the Utsi Electronics channel on YouTube. If you specify that utility detection is important we can supply location fitting software. This allows you to place a marker on the data after the hyperbola marking the position of the utility has appeared. Then you pull the radar back along its path until the marker aligns precisely with the centre of the hyperbola. The utility is located directly beneath the mid-point of the antennas. This feature is useful where you are required to mark up on site rather than (or as well as) producing a plan of located utilities. It is really important to establish what level of survey is required by your client. There is some very good guidance available through websites such as EuroGPR and The Survey Association. In both cases look for guidelines/guidance statements. It is important that the survey is completed to the requisite standard. We recommend joining EuroGPR if you are going to make use of this technology. It will help if you understand some of the technical parameters of your radar. If two pipes are closer together than the wavelength of your radar, they will appear to be one object, not two. If the pipe diameter is too small relative to the wavelength, you may not see the utility at all. We can help – check out the technical limitations on our technical page.